The Bestseller She Wrote is written by Ravi Subramanian and is published by Westland Ltd. I have received this author signed copy from BlogAdda as part of their Book Review program. This is I would say a thriller love story by Ravi Subramanian whose previous thrillers were also bestsellers. Cover: The cover is attractive and catchy the way it should be. 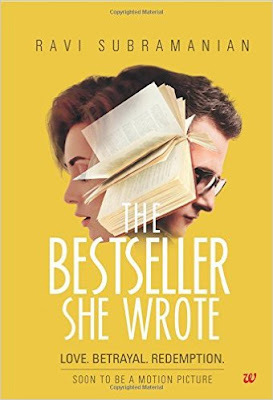 The image of a man and woman behind pages of a book ignites your interest in the book and later after reading the book when you recognized them as protagonist Aditya Kapoor and his protege Shreya whom he help to be a bestseller you liked the cover even more. Full marks to cover from me. Plot: Aditya Kapoor was a professional banker and a bestseller author who lived happily with his wife Maya a social worker and son Aryan. He met Shreya Kaushik during his lecture at IIM, Bengaluru. Shreya after a conflicting argument with him during lecture read his book and started admiring him. Her admiration, attractive looks and a confident personality insisted Aditya to force his friend Sanjay who was HR head of same bank as Aditya to hire her as a management trainee when they went for campus placements in IIM, Bengaluru. Aditya become addicted to her leaving all rights and wrongs about this relationship aside. Aditya even get ready to help her in getting published. Maya who trusted her husband blindly broke when she knew about his adulterous relationship with Shreya. She threw her husband out of their home and her life. At this moment she came in contact with Ebola while her trip to Paris for a conference on education. Aditya cursed his illicit relationship for her condition and started maintaining a distance with Shreya. It was then he discovered a new side of Shreya and the story took sudden turns which changed Aditya's life forever. Will Maya survive? Does Shreya's love have a hidden purpose? Will Aditya ever bring back his personal and professional life to normalcy? An unexpected climax would answer all your questions. Thriller: I liked the conceptualization of the story. It is simple yet has the complexity of a thriller. The climax is spellbinding and when each piece of the puzzle started fitting in right places the book became unputdownable. The language is simple and the flow of the story is just apt for the story. The backstage work behind a book is well narrated and in a way helpful for a debut ant writer. The characters are connectable to real life persons and leave an impact on you after reading it. Spoiler: More than half the book ends without generating any curiosity. Author took a lot of time before coming to the real story. The plot is not new and while reading I feel I have watched it somewhere on screen. The story is bit stretched till it reach the climax. Verdict: You must read it for the writer's approach towards the story and its fantastic end. Rating: I would give it 3/5. It was indeed unputdownable. Well reviewed, Cifar. 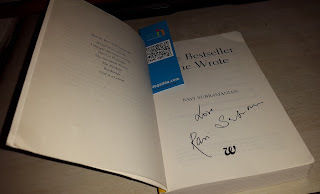 Archana, since you are a friend of Ravi shall I invite you to read my review too?